Making Rose used to be an afterthought. But it is different now. We take rose making very seriously,and pick grapes with the specific intention to make a naturally lively and crisp beverage that is light and quaffable, but has the structure to match well with lighter foods. We were again blessed with a compressed harvest where Valdiguie from French Camp near Shandon in warm northern San Luis Obispo County was ready at the same time as Pinot Noir from Rio Vista and Kick On in Santa Barbara. The Valdiguie was picked early and pressed especially for this rose. The free run Pinot juice was removed as the grapes were being crushed for red wine fermentation, and this 80% Valdiguie, 20% Pinot Noir came together before fermentation. We fermented long, slow, and cool in stainless steel, and put half in barrel to age on its lees until March, when we bottled this fresh and delicious preview to the 2017 harvest. Enjoy now and as it continues to develop over the next year or two. Bien Nacido has been a consistent and reliable source for us since 1991. It is hard to believe that we have made this great vineyard 25 times. A cool summer made us think it would be a late harvest. But the fruit maturity developed early, and we harvested from Aug. 13 to the 18th. 2015 gave us some of our best fruit ever – a small crop with very small berries. This can lead to intense flavors with great potential, if one can harness the results with balance and finesse. We used a lot of new Francios Freres French oak on this, to match the intense fruit flavors of wild berries in a rain forest. It opens as elegant and earthy with red fruits, and grows in the glass with big flavors in a manner of minutes. Our history with Sanford & Benedict Vineyard goes back to 1985 – 30 years ago! 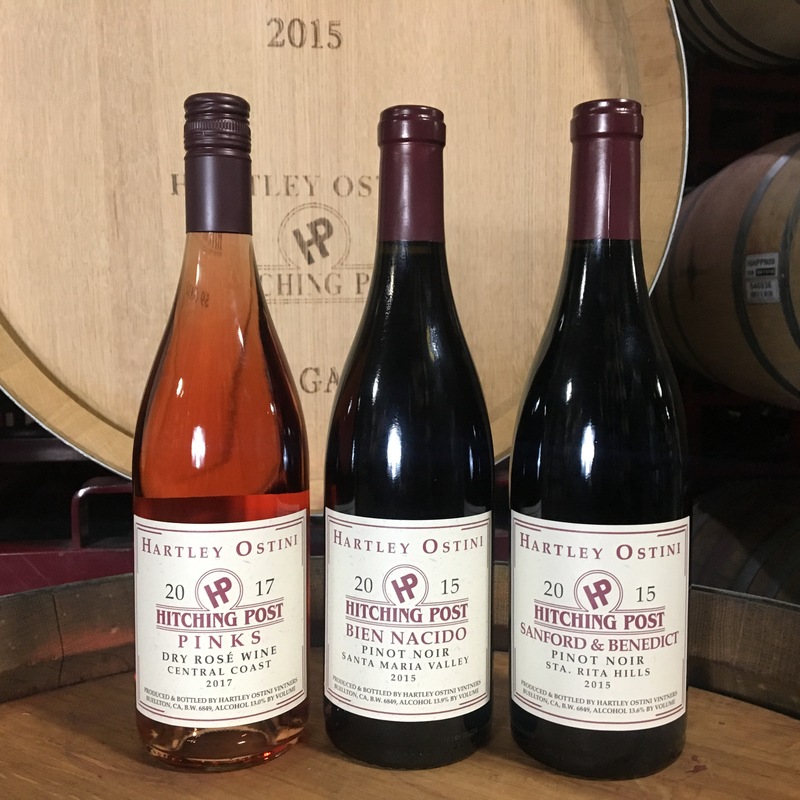 It has always been our most special source, and we believe it is one of the best sites for Pinot Noir in all of California. Last year we hosted a 40th anniversary party for the vineyard, and we looked back at 30 vintages from the vineyard. The wines showed wonderfully, many of them were spectacular, cementing our opinion of the specialness of this vineyard. This is just our second effort with this newer planting from 2008. Two sections planted high on the hill on very rocky soils laden with the Monterey shale from the mountains above. Again, a very small crop here was harvested on Aug. 18 and 28th. We picked picked the 667 early to get structure, acidity, and liveliness, then looked for more ripeness and roundness with the second pick of 777. We played the usual tight rope walk of trying to get full extraction without imparting excessive harshness in the final wine. We punched down a lot early, and then very gentle later on in the ferment. Aged on its lees in 75% new French oak barrels, and left undisturbed for 18 months, this was bottled in April 2017. Dark and brooding, showing hints of black fruit, mushrooms, and spice. This one is early in its maturity cycle, to open it now is like opening up the hope chest. Our hopes and expectations are that this will show well early, and continue to develop over many years.